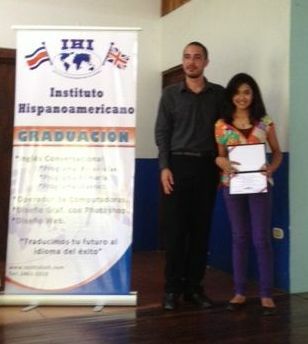 Costa Rica’s Graduation season is finally over! Comments Off on Costa Rica’s Graduation season is finally over! Graduation “season” started with her 6th grade graduation from the Central School of Atenas on December 12…then followed many fiestas to celebrate and it’s culminated with today’s graduation. This graduation was held in the building next to the police station. It included kids from age 8 up to maybe 15-16 years old. There were two young male instructors for probably 50+ students. Different classes met at different times of the day on Saturdays. When they were calling the names of the graduates to go to the stage to receive their diplomas, they announced to please applaud for each graduate. I couldn’t help but notice that a lot of the girls received a kiss on the cheek (a greeting in Costa Rica) when the instructor gave them their diplomas. What a change from the “old country” where heaven forbid you touch a student. They would call up maybe 15 students for diplomas then there was a break in the “action” to call numbers for door prizes….ie: free classes, dictionaries in English, more English instruction books, etc. I couldn’t help but notice that a lot of the same families won multiple times. The family sitting at the end of the table that we were at, won 5 different prizes. Reminded me of Bingo! After all this was over, then it was time to eat. They served a meal of arroz con pollo, ensalada, papas, and arroz con leche for dessert. (rice with chicken, salad, potato chips and rice with milk). It was pretty tasty!!! But I think anything I don’t have to cook or clean up after is pretty tasty! School will start again for Dylana in February and she’ll be off to Collegio (what we would consider high school). She’ll be learning French this year. Her Mom told us she’ll have 20 teachers….whew! Can you imagine keeping all of them happy? She’ll then graduate from Collegio in 5 years and hopefully going to the University will follow. Been a great experience to see these events take place….even if I am the “token Gringo”! And just like that, it’s 2014! Comments Off on And just like that, it’s 2014! Seems like not that long ago it was 2013….and now it’s 2014. They say time flies when you’re having fun – time is flying, we are having fun! We have celebrated our third Christmas and New Year’s in Costa Rica. Can hardly believe it’s been three years….and yikes, it’s time to re-new our cedula’s…….when we moved here, I knew it would be our paradise, weather-wise; and it is! It’s also been a great place to forge new friendships and meet new people from “all over da’ world”. Friends are here from Bowling Green and I’ve been looking at houses with them….took me back to when Terri and I were looking at houses; seems like ions ago. Have seen some pretty and not so pretty homes! LOL As when Terri and I were looking. Tiring, tiring days…..Terri and I looked at least 25 houses that week and ended up buying the first house I/we saw! This morning we woke up to gorgeous sunshine, the December winds blowing (yes, I know it’s January!) – it just doesn’t get any better than this…..many friends questioned whether we were doing the right thing moving here; for us, yes, it was the right thing! It’s not for everyone….you must have a little bit of adventure in you. Pura Vida and Happy New Year to all…..